Nothing new this week... but changes coming soon! Didn't pick up anything noteworthy yesterday at the shop, it was kind of a slow day. I am currently praying that it doesn't rain today as I am going to attempt to load as much stuff into the truck and haul it to the new 2-bedroom apartment in Greenville. I just found out that my wife will be able to transfer in approximately 2 weeks, so we have to get as much stuff from the house to the apartment as we can. Woo hoo. I am definitely loading my scanner, so hopefully, blog updates will be a little more frequent. We'll see though. Once the house sells and the dust settles, maybe I can finish up some of the sets I started... Hope so! I leave you with this cool post card I got while in Baltimore. If anyone feels really generous, you can get me tickets for my birthday, haha!!! 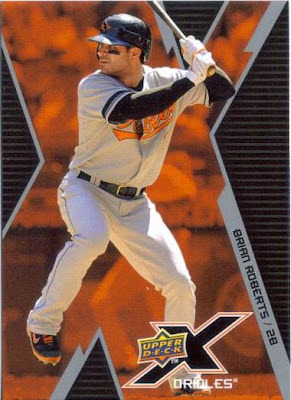 Thanks to Pete for hooking me up with some Roberts cards (as well as some Dodger cards for Max). I was afraid that I wouldn't have anything to blog about this week, as my pickings are slim. Cash is tight, plus I really shouldn't be buying anything with my birthday so close. With everything that is going on right now, I feel like my interest may be waning a bit. I think once i get this move done and once I am able to actually have some money, maybe some entries will be more frequent. Time will tell. Thanks for sticking around guys. IT'S HERE- BLOG ENTRY 100!!! Alright guys. Here it is. Blog entry #100. Are you ready? I started this blog on November 16, 2008, did not have a scanner and had no idea that a month later I would be offered a new position in the company that required me moving 4 hours away and packing all my stuff up, making this a little more difficult. I have completed several sets, gotten some 'big hits', met some new friends, reconnected with a good friend (my best friend), dragging him along on this wonderful ride which is my life. I had no idea where I was going with this blog (you can see that here), but I feel like it has evolved nicely into what you see today. I was talked into writing a blog by Pete and P.A. one Saturday at the shop. I cannot thank them enough for giving me an outlet to discuss and show off my cards. I also need to thank my mom for hooking me up with a LOT of cards over the years... a LOT of them. I have 24 followers (official, according to blogspot) and others who follow, but have not linked as followers. I have completed several trades. I have a couple still outstanding, we'll see if they get done. You may ask, what is my favorite entry on my blog? I have two. 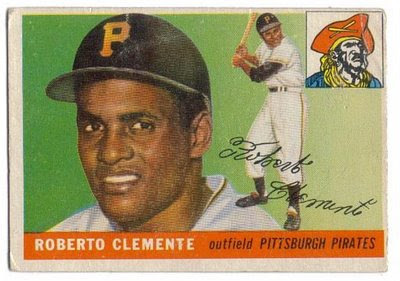 I posted an entry on Sunday, February 1, 2009 detailing my acquisition of this 1955 Topps Roberto Clemente Rookie Card. The second one is an entry I posted on Friday July 3, 2009. The videos of Max and I trying the gum from 1988 Topps. I have done some goofy stuff with my friends, but have not recorded it via webcam. The fact that Max plays along and puts up with me (which must be difficult) is amazing. If you guys haven't checked his blog, please do! He's a great guy. So, now, I turn it over to you guys. What post that i have done is your favorite? What card did you enjoy seeing most? I especially would like comments for this post, since post #100 is pretty important to me. Thanks again guys, and keep reading!!! You've got mail... or, I've got mail... whatever. Oh Raffy, what are you doing? 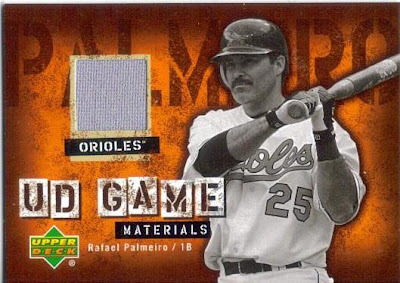 It still tears me up after 4 years knowing that Rafael Palmeiro was busted for steroids. Especially after waggling his finger defiantly in front of a congressional subcomittee (who was looking into corruption in baseball, when they really should have been looking into corruption in the banking and auto industries... but, hey, baseball is our national pasttime...). I still believe that Miguel Tejada had a whole heck of a lot to do with Palmeiro's suspension than he lets on. 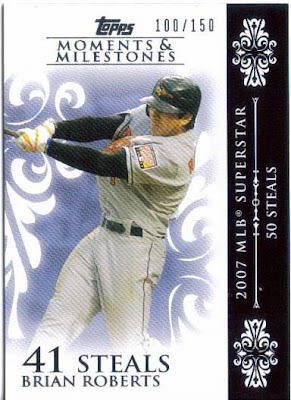 I was at the game when Palmeiro had hit # 2,990. Was a really great time. 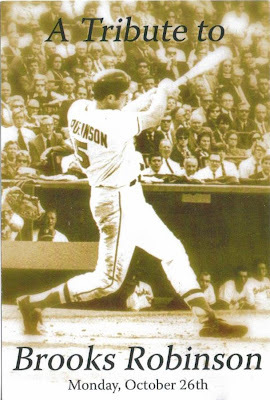 I hope that one day, some light will be shed on the whole thing and maybe he'll get in the hall of fame. I doubt it though. Ah, Rich Hill. I have heard some people say that if he can get his act together, he can be the ace of the Orioles staff. Wasn't that what everyone was hoping about Daniel Cabrera? Uggh. Anyway, I have seen Hill throw a few good outings, and I have seen him throw a few atrocious ones... Lets hope that the shoulder surgery he just had will correct the issues and maybe next year he will break out. Who knows. 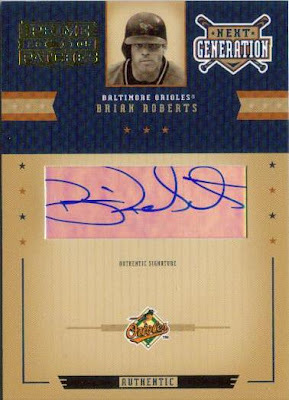 Finally, I traded a 2006 Sweet Spot WBC swatch card for this SWEET Brian Roberts auto (along with a 3 piece jersey card with Manny on it- this went to 'someone else'). 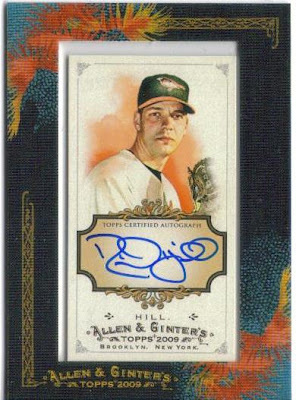 I think its a good looking card. Leave me some comments guys!!! My wife, son and I went to Baltimore to catch a few games against the Red Sox (big mistake) for our 5th wedding anniversary. We had a good time, although the Orioles stunk the place up (bullpen especially) Chris and I posing in front of Brooks' retired #5. Boog Powell cooking some Barbecue. He's a BIG BOY!!! Very nice, though. Boog took pictures with us and signed balls for us as well. Cal and Brady on the Orioles Wall of Fame. Chris and I by Brooks' number again. Chris had a really good time, but was disappointed that he couldn't go down to the field and throw his ball.